The River of Words Poetry Trail is a series of unique, temporary installations celebrating the nature-inspired poetry of local students winding through some of the Hudson Highlands' most inspiring natural settings. Poems or essays written during ROW workshops are eligible. Selected poems are committed by calligraphy onto fabric which will be hung along trails at Constitution Marsh, Garrison, NY, or Hudson Highlands Nature Museum, Cornwall, NY. 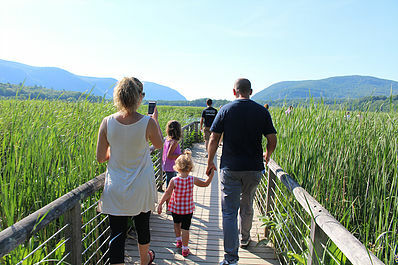 Eight poems were chosen for Constitution Marsh which was held in June 2017 and eight poems were selected for the Hudson Highlands Nature Museum which was held in September 2017. Our mission area school districts are Haldane, Garrison, Cornwall, Putnam Valley, Ft. Montgomery and Highland Falls.